Eternal Orthodox Church calendar for the 09.06 year 2017. He brought many Greeks to the Christian faith and was cruelly persecuted by the pagans, being starved, imprisoned and flogged. They stripped him and threw him to the ground, bound him to four posts and beat him mercilessly, until they had stripped the flesh from his bones. However, the martyr still remained alive and the four dry posts became green and grew into tall trees from which many of the sick received healing. 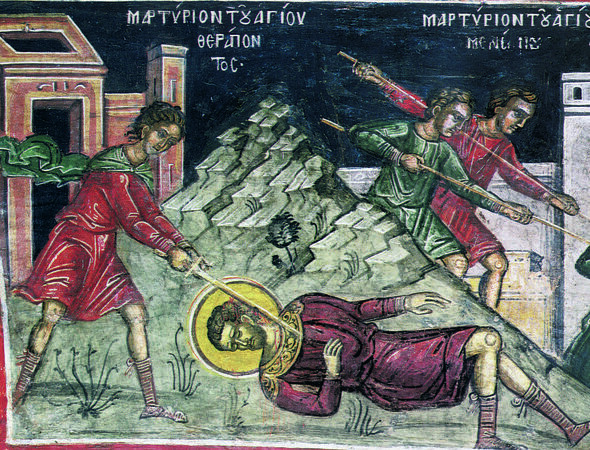 Finally St Therapon was slain like a lamb and entered into the Kingdom, to behold the glory of God in eternity. He suffered with honour in the time of Valerian, in about 259. In the reign of the wicked Emperor Maximilian, there lived in Alexandria a maiden, Theodora, well-educated and of noble lineage. She was brought to trial before the pagans for her Christian faith. After long interrogation and torture for the Faith, the prince, her tormentor, ordered that she be thrown into a brothel and the soldiers given free access to her to indulge their carnal lusts. 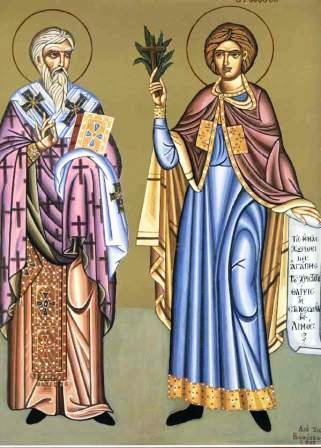 Theodora prayed fervently to God to save her from defilement, and, when she had prayed, a soldier called Didymus came in to her and told her that he was a servant of Christ. He dressed her in his soldier"s garb and himself in her dress, then let her out and remained in the brothel himself. He was seized and brought before the judge, where he acknowledged that he was a Christian and had saved Theodora, and was now prepared to die for Christ. He was condemned to death and taken out to the place of execution. Theodora ran up to him there and cried out: "Although you saved my honour, I did not ask you to save me from death. Yield the martyr"s death to me!" Didymus replied: "My beloved sister, do not hinder my death for Christ, nor the washing of my sins in my blood." Hearing this exchange, the pagans condemned them both to death, and they were beheaded and their bodies burned. They suffered with honour and received eternal wreaths of glory in Alexandria in the year 304. This David is one of the thirteen Georgian Fathers (see May 7th). 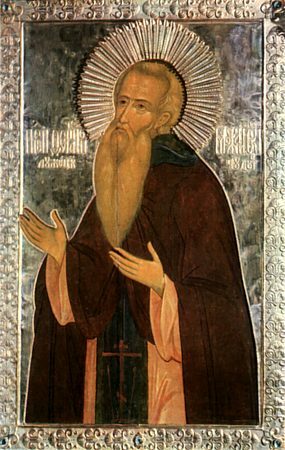 He is thus named for the Garejeli desert near Tiflis, where he lived the ascetic life. In old age, David decided to visit the Holy Land with several of his disciples. He left the direction of the monastery to two elders, Lucian and Dodo, and set out on the way. When they came to a hill from which Jerusalem was visible, David burst into tears and said: "How can I dare to walk in the steps of God incarnate with these sinful feet? ", and he told his disciples to go and worship at the holy places, but he himself took up three stones and set off to return. But the Lord did not let such humility remain hidden from the world, and an angel appeared to Elias, the Patriarch of Jerusalem, and said to him: "Send at once for the elder who is even now returning to Syria; he has taken with him three stones, and is carrying off with him all the Holy Land"s grace. One stone is a sufficient blessing for him; let him return the other two to Jerusalem. He is called Abba David of Garesjei." The Patriarch quickly sent men off to overtake the elder. They took two stones from him, and let him go on his way. The third stone lies on his grave to this day, and possesses miraculous healing power.